I am writing to you with the hope that you will fill out this application to be honored as a “Champion.” Champions of Caring honors high school students who have demonstrated character, an outstanding commitment to community service, and who are advocates for social justice. We promote these students as role models—as “heroes of our time.” Champions of Caring celebrates our Champions’ achievements at a community-wide Awards Ceremony held in the spring. Once honored as a “Champion” you will have the opportunity to join our Ambassadors Leadership Program. I founded Champions of Caring in 1995 because of my deep concern about the incidents of violence, bigotry, and indifference that plague our nation. The horrific events of September 11, 2001—and the daily occurrences of racism, religious intolerance, and hate crimes—must be stopped. Each of us can, and must, take an active viagra sin receta en farmacias role in improving our community. We cannot remain silent and indifferent in the face of ignorance, hatred, prejudice, violence, poverty, and need. My parents, Henry and Carola Greenspan, are survivors of the Holocaust. My mother is the sole survivor of a family of 65 people and my father worked for Oskar Schindler, whose life was the basis for Steven Spielberg’s film, Schindler’s List. I began Champions of Caring to ensure that atrocities like the Holocaust never again happen to anyone or any group. Champions of Caring is a not-for-profit organization dedicated to sensitizing, educating, and empowering young people to take active roles in improving their communities. By teaching the universal lessons of the Holocaust, which plagued my family, as well as modern atrocities which have happened in Rwanda, Darfur, and Bosnia, Champions of Caring encourages and nurtures caring behavior to combat the “disease of indifference,” which enabled, and still allows, such monumental human devastation to occur. The Champions of Caring Recognition Program (to which you are applying) honors and celebrates young “Champions” in our community for their outstanding commitment to community improvement and social advocacy. The Ambassadors of Caring Leadership Program is a year-long training opportunity that teaches “Champions” important leadership, advocacy, and communication skills. Workshops, retreats, seminars, and symposia are offered throughout the year to help support these “Champions” in their service. The Journey of a Champion School Program promotes caring behavior in the form of service and civic participation through high school English and/or History classes, middle school classes, and after-school clubs. If you are involved in meaningful service and have made an impact on your community, become a “Champion!” Join the thousands of students who have given hundreds of thousands of hours of service to our community. I look forward to receiving your application and honoring you at our special awards ceremony. 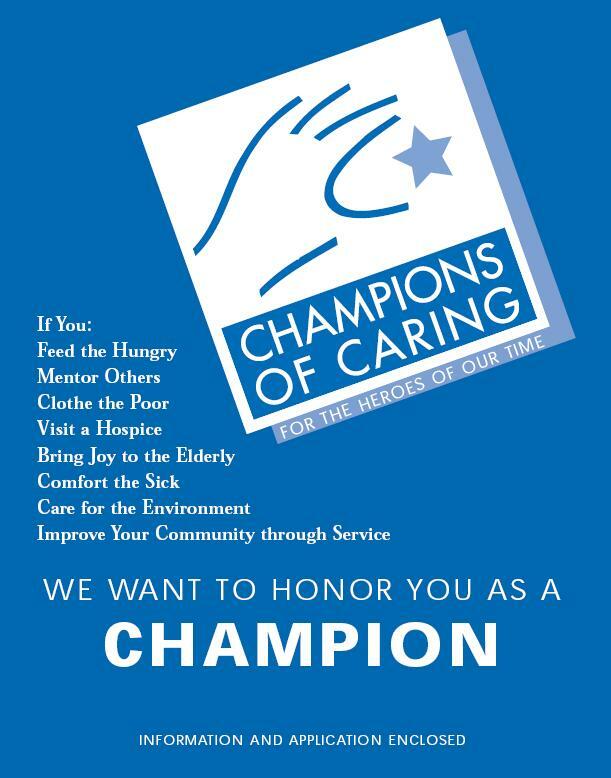 What is Champions of Caring? Founded in 1995, Champions of Caring offers community and school-based programs that nurture the development of character, compassion, and caring. Our three high school programs encourage service and effective citizenship, help reduce prejudice, and promote advocacy and social justice. Champions of Caring provides young people with the skills they need to make responsible personal decisions, to take action that cultivates self-respect and respect for others, and to make positive changes in their communities. What is the Champions of Caring Recognition Program? The Champions of Caring Recognition Program provides high school students with an opportunity to celebrate—and be celebrated—at an event that brings together hundreds from all sectors of our community to honor young people for their service. The Champions of Caring organization is looking for caring high school students from the greater Philadelphia region who do service to make this world a better place. If you or someone you know has made a difference to someone in need, or in your community, we’d like to hear about them. Have them complete the enclosed application and provide letters of recommendation. Receive certificates of recognition and letters of recommendation for college or work. Become part of the “Champions” family—meet and bond with teens who share similar values about service. Become role models for your peers and community. Join our network that provides information about community events, scholarships, awards, and internships. Be honored and recognized at a special community celebration, at school, and at graduation. Participate in conferences on service and social justice with dignitaries and local leaders. Participate in special service events sponsored by Champions of Caring and other organizations. Be eligible for the Ambassadors of Caring Leadership Program. What is the Ambassadors of Caring Leadership Program? The Ambassadors of Caring Leadership Program is a year-long program that prepares young people recognized as “Champions of Caring” to become social entrepreneurs and advocates for service and social justice. This exciting program consists of monthly meetings and workshops, retreats, and special field trips. The program assists “Ambassadors” in further developing leadership and communication skills. These skills include public speaking, interviewing, fundraising, planning, implementing, and sustaining service projects. “Ambassadors” not only develop their own skills, but also learn how to “teach” these skills to their peers and others. Honored “Champions of Caring” who are prepared to participate in the leadership program and create an impact project are welcome to join. Get to know and work with peers from different backgrounds who share your passion for caring. Travel and stay overnight in Washington, D.C. for an all-expense-paid VIP tour of the United States Holocaust Memorial Museum. Meet with politicians and share your vision for community improvement. Attend a youth leadership retreat. Learn advocacy, public speaking, and leadership skills from the experts. Do what you love…have fun…and make the world a better place. Once honored as a “Champion,” you will be able to sign up for the Ambassadors Program. Recommendations should be from an adult or peer who has observed you in your service, such as a fellow site worker, service coordinator, or site supervisor. Optional Material: You may include any photos, articles, letters, videos, tapes, or additional information that would be helpful in understanding your service project. (All submitted materials must have your name, school, service site, and a brief identification.) PLEASE NOTE: These items will not be returned. IMPORTANT: Please type your essay and include your name, school, and date on the top of your essay. PLEASE NOTE: Your essay could be shared with individuals or colleges who are offering scholarships. What person, place, or thing inspired you to do service? Describe the change or impact your service has on the community. Share information about yourself that will help us better understand you (family circumstances, obstacles you had to overcome, history of your service work, or other information). What part of the Ambassadors Program has had the greatest impact on you? Why? What are three things you learned about yourself through the Ambassadors Program? How have you changed or grown by being involved with the Ambassadors Program? Describe the change your Impact Project had on the community and on you. What new leadership skills have you acquired from the Ambassadors Program? Have your views about working with people who are different from yourself changed? How? Have your future goals (college, career) developed or changed due to your experiences with the Ambassadors of Caring Leadership Program? Please share any additional information from the ICARE Essay Guide that you feel can help us better understand how you have grown. Your application must include the following items, stapled together. Please check off each item and include a copy of this checklist with your application.